For the majority of my fishing life, I shied away from the combination of high and muddy water. I could handle one or the other, but the two together were intimidating. As I have gotten older and have gained more responsibilities, my fishing trips are becoming less common. So, I can't let non-ideal conditions stop me from having a good day on the water. This spring has been particularly wet and the rain much needed. It has been a perfect chance to further hone my skills in bodies of water flowing over their banks in water that is often the color of chocolate milk. Not only have I caught fish, but I have had some of my best days ever - and here is how. I have found the most helpful fact in fishing high water is that bass don't like to sit in the current, yet current brings them a smorgasbord of food choices. So the key is to find areas of slack water that are being affected by the current. In lakes, this means you can use the main river channel to your advantage, as well as hideaways such as creeks arms, coves, and tributaries. In rivers, it means you need to be selective about your targets and really dissect the river to find the best areas out of the current where fish will hold. The other general trend is that fish will move shallower to feed on crayfish, baitfish, and other life as they emerge. I break down lakes and rivers in the following ways. When lakes get muddy, I immediately pull out my map and locate the main river channel that flows through a lake. I try and find a number of areas close to that channel where fish can either sit just outside the current and feed on passing baitfish or sit way out of the current, often in shallow cover, because baitfish will also move out of the current. In those types of locations, food is being constantly brought to the fish and they use very little energy to consume it. An example of the first kind of spot might be a steep rock bank that forms a point. Bass will sit in crags in the rocks as well as on the down lake side of the point and ambush baitfish. If the water is falling or stable, they may then move out of those pockets and suspend near the vertical rock. As a kayak fisherman, this pattern can be tough because a) boat control can be difficult and b) you might have to run to a few spots before you find one that is producing good numbers of fish. That is why I tend to target shallower water when it is high and muddy. I like to find areas that I know have a lot of cover under normal conditions - logs, stumps, bushes, weeds, pads, etc. I then go within casting distance of the new bank, which might be anywhere from 1-5 feet higher than normal. I cast to every shallow target I can find, trying to change angles often and find different types of cover to pitch to, even if the water is only a few inches deep. If I am not getting bit, I back out a few feet and start casting to targets that I can barely see, most of which are situated along the original shoreline. Sometimes fish don't want to move, so they hunker down in their original cover. When water rises, that original shoreline becomes a drop-off, which is perfect for ambushing prey. If I am still not getting bit, I will back out a little more and make long casts covering multiple zones with a search bait. When you eventually find the the zone the fish are concentrated in, work it thoroughly with different baits and from different angles. Like any day on the lake, tackling high water is much like putting together a puzzle. But when you find a few pieces that fit, the rest can fall into place quickly. 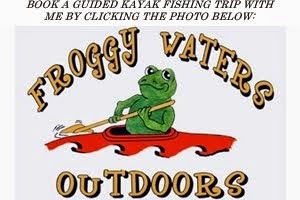 On a recent guide trip with Froggy Waters Outdoors, I took a client out to a local lake known for its weed beds. We started fishing in an area filled with weeds and lily pads with the water 3-4 feet higher than normal and highly stained. We had some blow-ups on frogs in the pads and caught a couple, but the bite was hit and miss. We moved a little to an area with less vegetation and more shoreline cover. We began throwing buzzbaits and black plastics around bushes and stumps in inches of water. It didn't look as pretty as the lily pad fields, but it out-produced the pads roughly 7:1. The word river immediately evokes the thought of current. So how do you catch fish in a body of water that is seemingly all current, has only a couple inches of visibility, and is flowing significantly faster than normal? Simple, you find eddies and current breaks. A few years ago I was fishing a tournament with Bill Kohls in mid-April. Typically by then, bass fishing in North Carolina is pre-spawn and the bite is fantastic. But that week the temperature dropped into the 30's with highs in the mid-40's. It also rained for two days straight, making the rivers muddy and a few feet higher than normal. We launched on a river we had never fished before and were targeting shallow wood and weeds with nothing to show for it. Then we found a big eddy and barely moved the rest of the day. The eddy was loaded with fish. They weren't all active at once, but over the course of the day we would catch a few, then let if rest, then catch a few, and repeat. We nearly won that tournament and might have won it were it not for a fish that bent the hook straight on a lure. Eddies are a river fishermens best friend when the water gets high. Not only does it give fish a place to get out of the current, but it brings a never ending supply of food right to their nose. Eddies may occur behind rocks, trees, root wads, islands, weed patches, or other pieces of cover. One of my favorite things to do is find the biggest shoal and rapid on a particular stretch of river. The eddy of this rapid is typically quite large also, so fish will stack up in it. I try to make long casts right down the current seam and also mix a few into the calmer portion of the eddy. Then move to the next shoal-rapid-eddy combo and repeat. In prime eddies, you can often catch bass after bass without even moving your boat. In fact, on a recent guide trip on a local river, a client hooked up with bass on six consecutive casts. I find that the trend of bass moving shallow during high water is more prevelant for lakes. However, in rivers, areas that are typically out of the water will be underwater during high flows and will hold fish. Again, the key is to find new current breaks to focus on, no matter how shallow or deep. On lakes I like to rig roughly 5 baits depending on the time of the year. No matter what time of the year, I will rig a jig, tube, or creature bait in black to pitch into shallow cover. I like to use a 1/4 oz to 3/8 oz tungsten sinker pegged above the bait, which is rigged on a 4/0 or 5/0 Gamakatsu EWG worm hook. I pitch it as tight to cover as possible and let it fall. Sometimes, it takes two or three lift-fall sequences before you get bit. Other days, they eat the bait on the fall. If that doesn't work, I will pitch past my targets and slowly work the bait toward them. I typically also tie on a crankbait and spinnerbait in white, white & chartreuse, chartreuse, or black. Although I fish silent cranks much of the year, I will throw rattling baits in dirty water (in addition to the silent cranks). I like to use square bill cranks like the Lucky Craft SKT MR or flat sided balsa cranks like my new favorite, the CP Baits Series 2 crank. The key with crankbaits is deflections. You want that crank to hit off of anything and everything to elicit a reaction stirke from a nearby bass. My go-to spinnerbait is the Premier League Lures River Series in 3/8 oz or 1/2 oz. At times, especially in cold water, I tweak the blade combinations for maximum vibration and go with a tortoise or Indiana blade. You might also have to work your spinnerbait very erratically - killing it, yo-yoing it, bouncing it off logs, rocks, and the bottom, and changing speeds multiple times per cast. My other two baits rotate depending on conditions. Early in the spring, I might rig a lipless crankbait such as the Lucky Craft LV series or a jerkbait like the LC Pointer 78 SP. As spring progresses and summer approaches I will throw more topwaters, swimbaits, weightless stick baits, shakey heads, and even Alabama rigs depending on water depth. In rivers, I fish the same baits nearly all year long if the water is high and muddy. I almost always rig a flat sided crankbait and a spinnerbait. These are perfect for shoals, rocky areas, wood cover, weed lines, and seams. I also like to throw a 5" weightless stick bait and a crayfish immitator like a jig, tube, hula grub, or plastic craw. I may also dropshot a soft plastic helgrammite or 4.5" Roboworm. These baits are great along current seams and in the middle of eddies. If the fish are particularly aggressive, I will throw a topwater such as a Lobina Rico Popper, S.O.B. buzzbait, or Lucky Craft Gunfish. 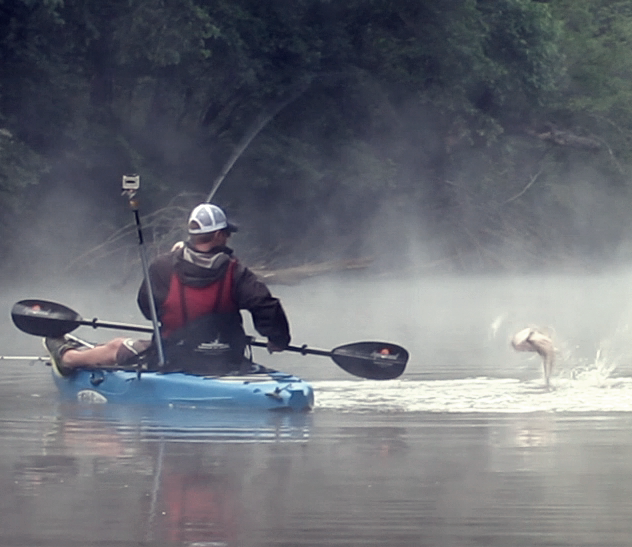 The term topwater explosion barely describes the way river bass gorging on shad crush a topwater. Again, with all of these baits, I like to use black, white, chartreuse, or combinations of the three. Always remember when fishing a river, or any area with current, to retrieve your bait with the current. It is not natural for baitfish to swim against the current, so focus on neutral or downstream angles of retrieve and you will get a lot more bites. And with all of the baits above, make sure you sharpen your hooks regularly. When bass start gorging on baitfish, they often just slam the smaller fish, often knocking them out of the water. This stuns or wounds the bait and makes gulping them a lot easier. You will find that you will catch fish hooked in the top of the head, side, and other random places when they get aggressive in high water. Along the same lines, always keep an eye out for shad being pushed to the surface, surface blow-ups, and other signs of feeding fish. Indicators like that are another big help in putting together a pattern. Also remember that high water can fluctuate from day to day, especially in rivers. One local river dropped over a foot in one night this past week. After a successful guide trip, I went back the next day to do some fun fishing and the eddies we had fished the day before were nearly gone. I knew the fish were still around and feeding, but they were not in the same areas. Eventually, I found new areas, established a new pattern, and had an even better day on the water with my best 5 fish measuring 103.75" and weighing 27.2 lbs. That should sum it up. You know what areas to look for, how to break down those areas, what baits to throw, and how to work them. Now go out and practice and don't be intimidated by the less than ideal conditions. Every body of water will fish slightly differently, but with some effort you can break down the pattern. Tight lines! You have the same pic posted twice. Great info. Ha - actually same spot, same lure, same day, back to back casts, but two different fish. The first one was 21" and 5 lbs 10 oz on the scale. The second was 21.75" and 6 lbs 3 oz on the scale. I also ended up with 3 on the fly over 17" that day - the biggest going 20". I had another one jump and spit a big shad fly that was pushing 20". Super fun day! Haha - three particular spots were absolutely loaded with bass. I mean cast after cast after cast. I was super glad I took the fly rod. The fishing was just insane. Man I would love to get some more knowledge off of you! I live in Winston Salem and I'm a new angler. (I've caught 2.) email me at tryanwilliamson@gmail.com if you don't mind! Really it's great bass fishing in muddy water. Thanks for sharing your experience.